Imagine that you feel called to start a Bible study. You spend time researching study guides and planning a schedule that works well for everyone. Figuring out exactly where your group will meet isn't even a concern—your church likely has plenty of available rooms to choose from. But many Asian believers are only now discovering the joy of having a church building where they can regularly meet and worship. Hundreds more are still praying for such a place of sanctuary. Although a growing congregation is cause for rejoicing, it can also mark the beginning of serious problems and persecution—especially if the believers have to crowd into small homes or rented buildings. The average cost to build a church in Asia is $10,000 - $40,000. A new church building, however, is a rock of stability for believers and a beacon of hope for the unreached. These churches become like the city on a hill that Jesus talked about in Matthew 5:14, giving light in the midst of the Enemy's darkness. The gift of a church building represents more than a convenient place to meet. 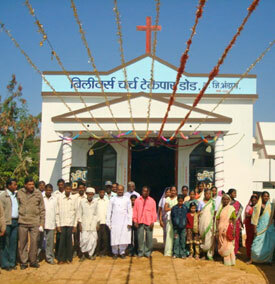 It is a centre for loving fellowship and a launch pad for sharing Christ's love with the community! Read this story . . .
GFA World-supported national missionary Javal Mehra faced a dilemma. 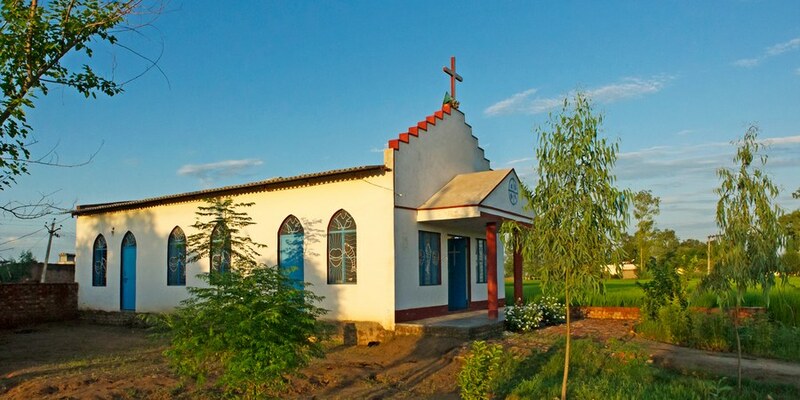 Starting a church in a village of 600 homes, he felt blessed that the congregation had grown from just two families to more than fifty families within a few years. But that growth had created a major challenge for the little group of Christians. When the church outgrew Pastor Javal’s own small house, they first moved to a temporary bamboo structure they built themselves. And while that did provide some protection from the elements, as the church continued to grow, it became difficult to accommodate all the believers and visitors in its limited space. That’s when, after much prayer, Pastor Javal asked GFA World if it would be possible for them to provide financial help for a permanent church building. His church members were willing to provide land and their own labour for the building, he explained to the local GFA office; they just didn’t have the funds for the materials. In answer to his prayers—and those of the enthusiastic congregation—GFA said “yes,” and today Pastor Javal’s church has a modest facility large enough for everyone to worship together. As a result of this new facility, the church is adding even more families as its enthusiastic members reach out to share the Gospel with all those around them! Please pray for other churches like Pastor Javal’s, that they will also be blessed with buildings that will allow them to worship the Lord together and reach out to others with the love of Jesus Christ. of their new church building. Sampat Kolagunta’s ministry began like any other. For six years, the GFA World-supported missionary labored to bring the Good News. He started with a small group of believers worshiping in the home of a local Christian. They experienced frequent opposition from their neighbors and local anti-Christian extremists, but in spite of these problems, the Lord enabled Sampat and the believers to stand firm in their faith. Within a few months, the opposition vanished, and Sampat’s ministry continued to flourish. More than 330 believers crammed into one home to worship the Lord. The space limitations made it difficult for them to gather. So they began praying for a church building. For several years they asked the Lord to provide them with a large enough place to call their own, and, in His perfect timing, the Lord finally answered! first worship service in their new church home. 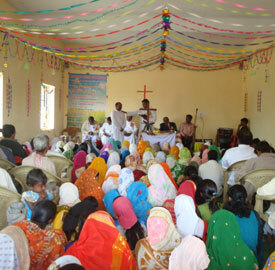 Donors from around the world provide funds to build churches in South Asia. Sampat’s congregation received funding for land and materials. Then they built their own church building. Now Sampat and the believers have a place to freely worship the Lord.